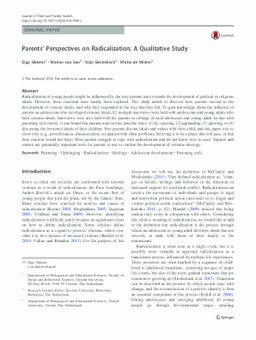 Abstract: Radicalization of young people might be influenced by the way parents react towards the development of political or religious ideals. However, these reactions have hardly been explored. This study aimed to discover how parents reacted to the development of extreme ideals, and why they responded in the way that they did. To gain knowledge about the influence of parents on adolescents who developed extreme ideals, 82 in-depth interviews were held with adolescents and young adults who held extreme ideals. Interviews were also held with the parents or siblings of each adolescent and young adult. In line with parenting style theory, it was found that parents react in four possible ways: (1) by rejecting, (2) applauding, (3) ignoring, or (4) discussing the (extreme) ideals of their children. Few parents discuss ideals and values with their child, and this paper tries to show why (e.g., powerlessness, disassociation, occupation with other problems, believing it to be a phase that will pass, or that their reaction would not help). Most parents struggle to cope with radicalization and do not know how to react. Support and control are potentially important tools for parents to use to combat the development of extreme ideology.